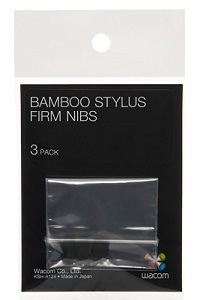 If you like to keep a firm hand on your Bamboo Stylus when working on iPads or other tablets, try the Firm Nib. It's made with a thicker rubber, providing a harder tip to withstand more pressure during use. The firm nib delivers a bolder, smooth feel on the glass surface. Firm Nibs easily attach to the tip of any Bamboo Stylus by Wacom, including the Bamboo Stylus solo, Bamboo Stylus duo, and Bamboo Stylus pocket. Simply unscrew the existing nib from the tip and replace as needed.